Our family trip to see the launch of STS-132, the final Atlantis mission. The day prior to the launch, we toured the buildings that prepare all space station components for launch (ISSPF), that prepare the orbiters for launch (OPF), and that mate the space shuttle (VAB), and then visited the launchpad of STS-132. On the second day, the launch! And we watched from just three miles away. After the shuttle launched on schedule, we used our launch buffer day to see Universal Studios. More shuttle coverage: NASA, Wikipedia, and The Big Picture. 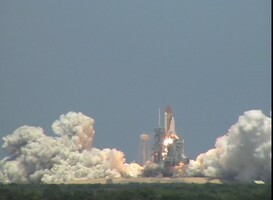 In May of 2009 we got to see the launch of Atlantis for the final shuttle mission to the Hubble Space Telescope.